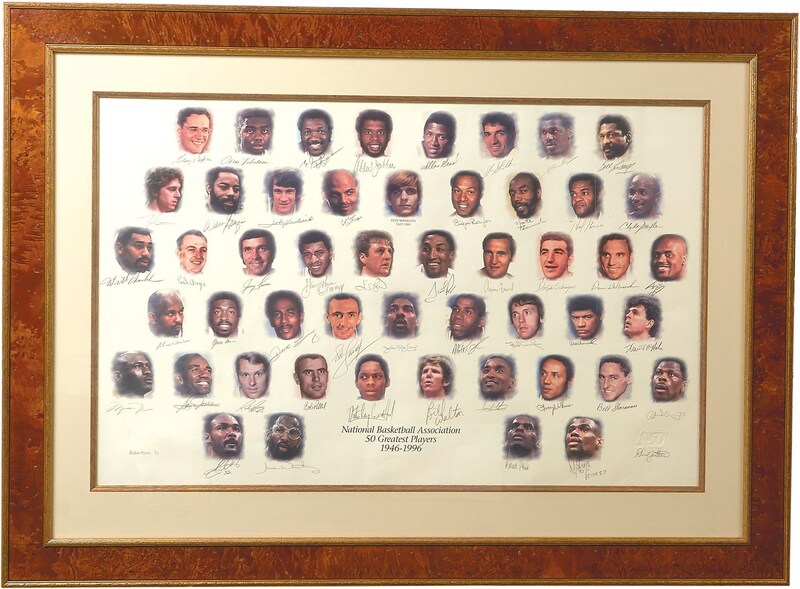 In celebration of the NBA's 50th Anniversary in 1996, the league named an impressive list of its top 50 players of all time and recognized that group in this amazing lithograph. Amazingly, 49 of the 50 players were still alive and able to sign (Pete Maravich being the lone exception). A limited number were made available to the public, but each player was given one, individually numbered. Very few of these have come to market and this one comes directly from one of the greatest ever, Oscar Robertson. Simply magnificent, this framed and matted 50.5x39" masterpiece features a photo of each of the honorees above their signature, with a bonus of NBA Commissioner David Stern signing the bottom corner. Signatures average 8-9/10 and litho is NM - this is the one that was given to The Big O and is numbered at the bottom "Robertson 1/1." While others have been sold, in our opinion this is the most important and valuable one to date, being from one of the most talented and beloved figures in the sport's history.